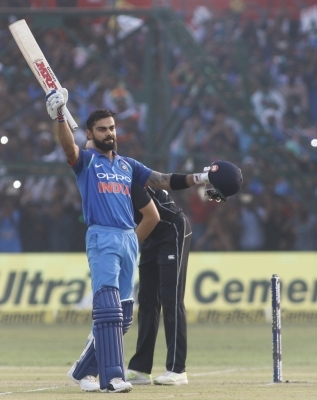 Kanpur, Oct 29 (IANS) Brilliant tons from opener Rohit Sharma (147) and skipper Virat Kohli (113) helped India post a challenging 337/6 in the third and final One Day International (ODI) cricket match against New Zealand at the Green Park Stadium here on Sunday. Rohit struck his 15th century in ODIs, fifth of this year and first against New Zealand, while Kohli slammed his 32nd ton and fifth against the visitors to help India score the highest total in 15 ODIs here. The previous was 303 by South Africa against India in 2015. For New Zealand, pacer Tim Southee, Adam Milne and spinner Mitchell Santner scalped two wickets each.